Never Enough Nails: Swatches of New Sally Hansen Shades from the Digital Overload Collection! Swatches of New Sally Hansen Shades from the Digital Overload Collection! Monday already??? The weekend really flies by, doesn't it? And here we are right back at Monday yet again. But I do have some pretty new Sally Hansen polishes to show you to hopefully make your Monday brighter! These three are from the new Digital Overload Miracle Gel collection. Right from the minute I saw these, I was most excited about Sally Hansen Let's Get Digital. Now, I originally thought that this would be a pale blue standalone creme with loads of pink shimmer, but it turned out to be a sheer blue topper with lots of pink shimmer. It adds a lot of shimmer and depth with just one coat, so I'm not bothered by it being a topper. I think it will actually make it more useful, because you can layer it over lots of colors! Above, you can see one layer of Let's Get Digital over Sally Hansen Miracle Gel Dive Bar, a robin's egg blue creme. Let's Get Digital was super easy to apply and went on very evenly. Below, you can see two coats by itself. You can see it's nice and even, but very sheer. I want to try this over a mint green creme to see if it's sort of dupe-y for YSL Peace Green. Stay tuned for that post! 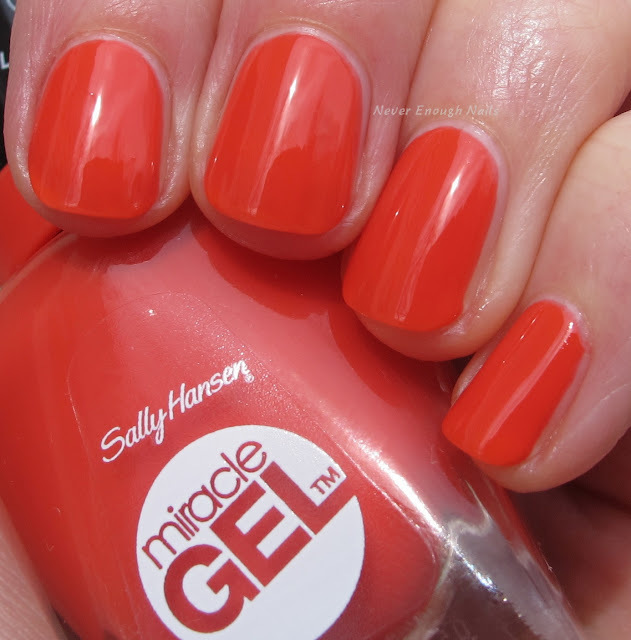 Sally Hansen World Wide Red is a bright orange-y red creme. It has little touches of coral in the mix too. I actually think it looked more orange than this in person. I love a good bright orange red for summer, so this will definitely go in the rotation! This is two flawless coats. 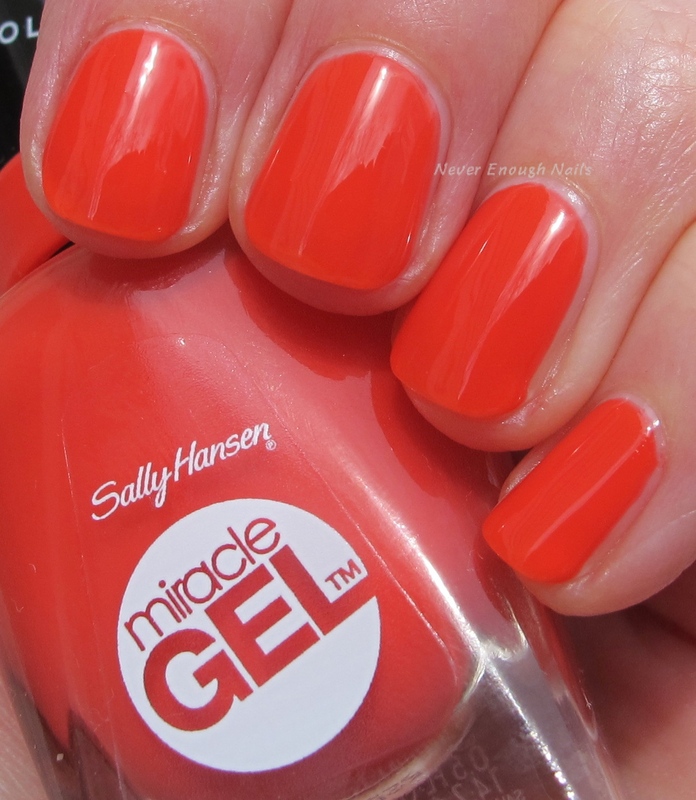 I do love the Miracle Gel formula! I find it to be easy to work with and a great consistency. If you're looking for a new bright sunshine yellow creme this spring, look no further! 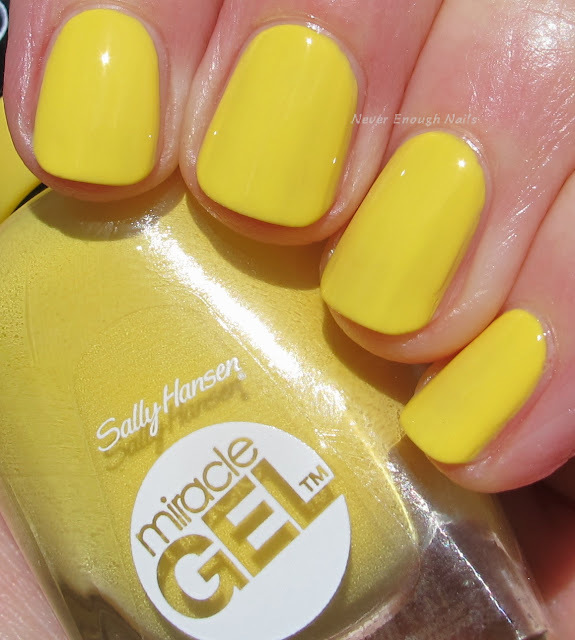 Sally Hansen Gigabryte is a gorgeous sunny dandelion creme. Very bold-looking and happy! This is two coats and nary a streak in sight! Yay for smooth coverage yellows! The first coat maybe had a streak or two, but they were quickly covered up and evened out with the second coat. This has a great formula, nice and opaque, and surprisingly easy to use for a yellow creme. All of these swatches were topped with one layer of the newly reformulated Sally Hansen Miracle Gel Top Coat. I love that top coat. I actually have been using it with other polishes. I find it to be very plush and shiny and it dries fairly fast without being a QDTC. It works really well with the SH Miracle Gel polishes for sure. These three beauties are available now at a drugstore near you!